I’ve been afraid of dogs for as long as I can remember. Still am, if truth be told, except for a few dogs and only after careful observation of their behavior. I was 18 the first time I met a dog that I really loved, and eventually lost my fear of her. A beautiful Brittany spaniel named Lady owned by my ex-husband’s parents. She was a gentle and loving pet, smart as hell and was like Nana (The Darling’s dog from Peter Pan) to my sons. I remember her always going up to Naughty Bear when she would enter the room, giving him a sniff to make sure he was okay before going off to do her thing. There was even a time when a two-ish year old girl was petting Lady, until someone called her name. When she girl turned, her fist clenched reflexively. It would have been no big deal, except that it caused her to catch Lady’s upper eyelid in her little clenched fist. Lady didn’t bark, snap, growl or even move as the little girl’s fingers were gently taken out of Lady’s eye. I sat in awe as she held perfectly still and silent, and then immediately left the room when freed. I’m guessing she went to hide, but that inspired total trust in her on my part. She showed me that a dog could be more than just a high maintenance cat. And I’ve never really loved a dog that much since then, until Kaylee. The two attempts in my Old Life to have dogs were disastrous, on many levels and for many reasons not worth going into here. I decided I was simply a Cat Person, and didn’t give it another thought until recent years led us to circumstances to be able to get Kaylee. I was going a bit baby crazy, and since we very maturely decided against having any more, that morphed into puppy crazy. We waited a few years for circumstances to be right before we began looking in earnest. Because of my base fear and previous experience, we sought out a puppy by breed rather than through the shelter. Oh, I tried the humane route and after being viciously barked at and seeing dogs throw themselves against the pens to try and get at me I gave up. They scared the bejesus out of me, to the point that I sat shaking in my car after each attempt. We eventually found our pup through an online service and went to meet her while she was still too young to adopt. The owners were clearly devoted to their pets and the litter, and were lovingly attended to by the entire family. Spending time with both of Kaylee’s parents prepared me for their large size and also enraptured me with their intelligence and sweet dispositions. Hubby, son and I completely in love with her, Kaylee Sioux Valentine joined our family about a year and a half ago. With Chooch’s help, and great follow-through by the boys, she has grown into a wonderful and loving, yet spirited companion. We definitely got lucky with her loving disposition, but it is clear to me that our consistency in training has helped with almost everything else that is so wonderful about her. She has even taken to our adventures, going with us to visit friends (she occasionally gets a little TOO excited playing with their pups, so we’re still working that out) and also on our runs around the neighborhood. She is great with strangers and other animals, although she still gets super excited when squirrels cross her path. This dog is a lifelong companion, and I look forward to our future together. I have to say, this comes as quite a shock to me, even after all the years of having Lady in my life. My mother always attributed my fear of dogs to being bitten when I was very young. I don’t know if that’s it, as I certainly don’t remember the incident, but it’s definitely a primal fear. Even interacting with dogs owned by friends I still feel a flutter of panic when I encounter a new dog. And regardless of size, if the dog shows any aggression, the panic kicks in full force and I’m pretty much done. Instinct is key for me, and I always follow it. Maybe the dog bite actually is the root. With this background, you can imagine my surprise when I came across some photos from when I was very young, playing with a very large dog. I’ve always remembered that we had a dog named Black Jack , but had no recollection of the animal itself. 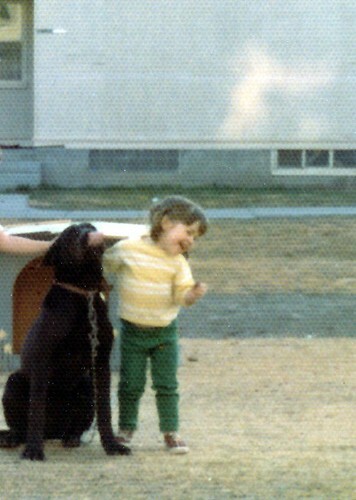 The joy in my face as I played with this beast shows that I wasn’t always terrified of big dogs. I was younger than 4 years old when we left that residence in Alaska, but beyond that have no idea how old I am. I kinda look like a Dog Person, too.